Here it is, folks: The top 10 most awesome skydiving fun facts in the sky. You heard it here first! Have you ever had a long day? Well: it can’t compare to Jay Stokes’ 50th birthday. To celebrate, this Special Forces veteran completed 640 parachute jumps in a single 24-hour period, smoking the previous record of 534. (That previous record was his, too.) Stokes’ will of iron is matched only by his heart of gold – that superhuman effort raised a sweet chunk of change for the Special Olympics and for the Special Operations Warrior Foundation (which provides college scholarships to the children of special-operations soldiers killed in the line of duty). Georgia ‘Tiny’ Broadwick stood a whopping 4’1” and had just celebrated her 15th spin around the sun when she made her first landmark skydives. On June 21, 1913, she became the first woman to parachute from an airplane (over Los Angeles’ Griffith Park). 3: … And that’s not all. Tiny looms large in skydiving. She was also the first woman to parachute into water – and the first person to perform a freefall skydive. A year after her first jump, she was already demonstrating parachutes to the U.S. Army from their sketchy-to-jump-from airborne fleet. On one of those “demo” jumps, her static line got tangled up in the tail assembly, so she opted to cut it off and deploy her parachute by hand. Boom. Freefall was invented by a woman. During his highly publicized Red Bull Stratos Jump (during which an energy drink company appeared to have a better space program than the United States of America), Felix Baumgartner reached a freefall speed of 834 mph. He broke the sound barrier with his body. In 2012, Anders Helstrup of the Oslo Parachute Club took off from the Østre Æra Airport in Hedmark, Norway. On the way down, he was buzzed by an actual-factual meteorite. It, like, totally almost hit him! Luckily, he caught the moment on film. Back in 1975, skydiving student gear was quite a bit bigger than it is now. That doesn’t make this fact any less gonzo, however. Basically, a skydiving student’s main parachute managed to get entangled with the plane. To try to save the situation, the student deployed his reserve parachute. The extra drag caused the plane to stall and engines to fail. Happy ending alert! Everybody on board survived. The plane descended to the ground under the skydiver’s reserve parachute. 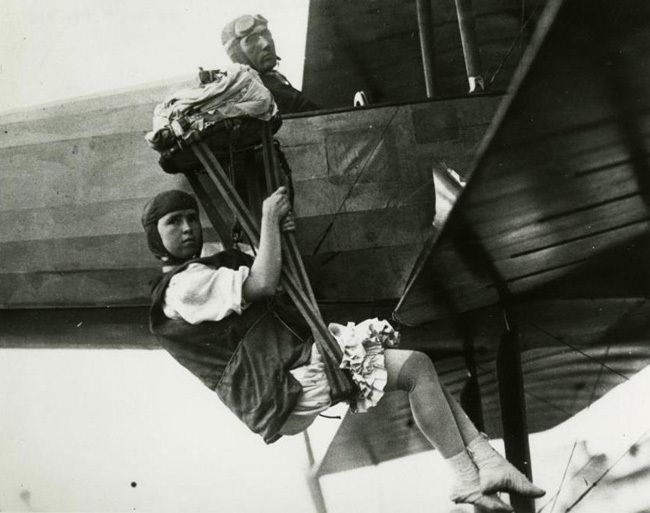 Vesna Vulovic, a Serbian flight attendant, survived the highest ever fall by a human being after the plane she was on broke up at 33,000 ft. Everyone else perished; Vesna, however, was seriously injured (and temporarily paralyzed from the waist down), but she pulled through. She even returned to work for that same airline (this time, in a desk job.) She’s in the 1985 Guinness Book. Vesna died in 2016, at the age of 66. The moral of the story: When it’s not your day to die, it’s simply not your day to die. Full stop. 8: The guy who got by with a little help from his friends. Nitro Circus co-founder (and motocross household name) Travis Pastrana is a legendary daredevil. His crazy stunts abound, but our favorite is the legendary skydiving hijinks he pulled with his nutso crew. He jumped right out of an airplane entirely sans parachute, relying entirely on his friends to clip him into a harness in freefall — at 120mph — without necessarily knowing if they’d be able to pull it off. Ultimate trust fall, yo. Arrow, the first skydiving anti-poaching dog, jumps into the African bush with his handler, Henry Holtshyzen, as part of an unusual effort to combat poaching in protected wildlife reserves. Several countries are following suit, training dogs to skydive into remote areas that face difficult-to-stem poaching problems. You’re a legend, Arrow — those elephants will never forget you! 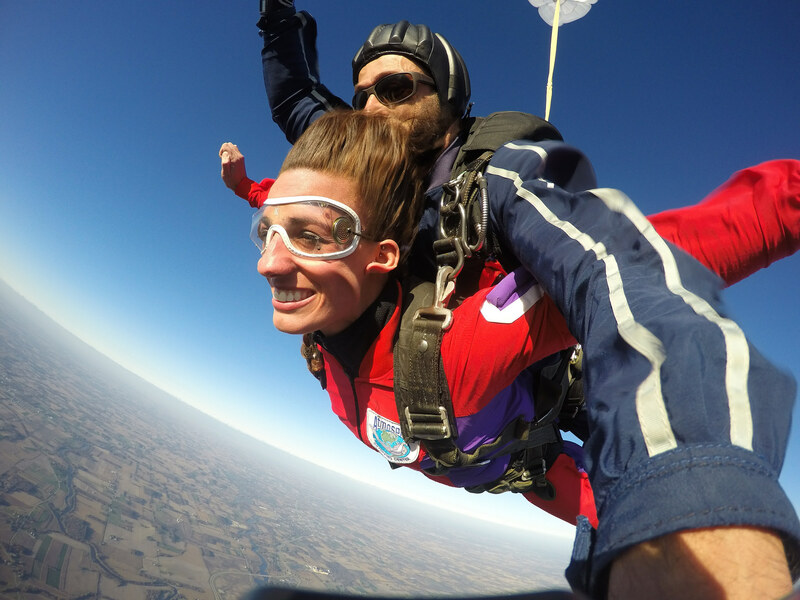 10: YOU can skydive, too! This might be the biggest surprise of all: that you — yes, you! — are a skydiver, heart and soul. At the Wisconsin Skydiving Center, we specialize in introducing new jumpers to the sky in the most caring, attentive, thorough manner possible. It’s a fact! Make your reservation today and we’ll prove it to you. Why People Say They Wish They’d Done it Sooner!